Anyone who turns the cranks of a bicycle and cares about athletic performance would benefit from using a cycling power meter. If you’re one of those athletes who listens to your training buddies say things like, “What’s your FTP?” and, “How many watts did you push up that hill?” then perhaps you’ve wondered if it could change your training and racing. Imagine knowing exactly how to ride during an interval or workout and then translating those efforts into race day performance. This is one training tool you’ll want to own and use. 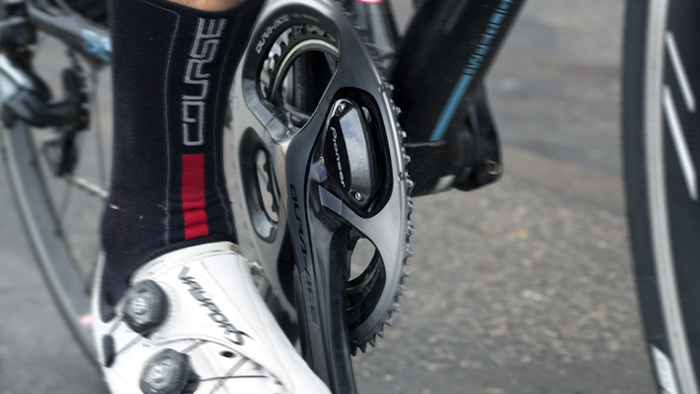 What is a Cycling Power Meter? Before I get into why you need a power meter, I first want to discuss what a power meter is and what it measures. Power meters are usually made of a strain gauge that measures torque and combines this with velocity to calculate power in watts. A simple mathematical representation is P=F x v, or power equals force times velocity. The force is you pushing your foot against the pedal and the velocity is how fast you can turn the cranks. Power meters come in many different styles, and options have increased while prices have fallen. They are made for installation on a bottom bracket, the rear hub, crank set, chain ring or even the pedals. The information is displayed in watts instantly on a head unit, which also collects and stores your data. Now that you know what a power meter is and what it measures, here are my top four reasons you should own one. Watts are a much more accurate way to measure your effort since they show the actual workload your body is putting out versus heart rate, which is measure of your body’s response to the workload. Additionally, watts instantly respond to an increase or decrease of effort as compared to heart rate, which takes time to respond. For example, if you are doing a interval at zone 3 power, the instant you stop pedaling, you are no longer putting out the work in that zone and that is reflected in your power file. However, your heart rate will take some time to come down, so it would show time in zone 3 when you were actually coasting. Your training zones will also be more accurate when you use power. A 20 minute all out field test allows for determination of Functional Threshold Power (FTP), representing the amount of watts an individual can maximally push for 60 minutes. With an accurate FTP, your power zones can be used to train and race for maximize your results. Your FTP is something that can be elevated through training properly, and when done, you can ride faster with a higher power output for the same amount of effort. Having a power meter means you can objectively understand your individual strengths and weaknesses as a rider. If you are a triathlete or time trialist, you would want to have high 20, 30 and 60 minute power, whereas a sprinter would want high 20, 30, and 60 second power. The data from your power meter can help you recognize your weaknesses as they apply to your event. You can then create workouts to address your weakness. Beyond your ability to put out power over a given time, power data can also show you other strengths and weaknesses. For example, you can see that you may be stronger when you ride a lower cadence, or that you climb best when you stay seated and have a high cadence. Knowing these details can help you pick events that you are best suited for and create race tactics that will help you optimize your efforts. After you’ve identified your weakness, the next step is to improve it through specific sessions. Using a power meter means you can maximize your training time by designing workouts that are very specific to your individual needs. If your race goals include road racing, dialing in workouts like over/under intervals that require riding below and above threshold can teach your body to clear lactate much like dealing with surges on race day. If you are a triathlete training for an Olympic distance race and need to ride for 40K just below threshold, the pace can be practiced in training and developed through riding in the 88 to 93 percent FTP zone referred to as ‘sweet spot’ or by working just at threshold. Also, by tracking changes in threshold, workouts can be incrementally adapted to fitness changes, continuing to challenge the athlete and stimulate physiological change. A power meter is going to show the watts being generated whether it is windy, hilly, raining or hot. Unlike using speed as a metric, it is consistent to effort. Finally, a power meter can take all of the guesswork out of racing. Not only does an athlete know what numbers to look for during the event, but it is also clear what the individual is capable of before combusting. This allows for proper pacing and race execution, especially when combined with Best Bike Split. An Ironman distance event is an excellent example. Using FTP and comparing the watts generated in a given workout allows for determination of the Intensity Factor of that workout. This metric is good for comparison between the intensity of every race or workout that is completed on a bicycle. Ironman age groupers usually ride with an Intensity Factor® (IF®) somewhere between .60-.701. This range has shown to give an athlete the best opportunity for a successful run. Using data from a power meter, the Ironman athlete can ride all day in the proper zone and feel assured they will be ready to run well if everything else comes together. In summary, a power meter is a great tool for every cyclist and triathlete. It teaches you how to ride stronger, more consistently and allows for tracking, planning and training with specific focus on your unique needs and goals.